Donald Trump, the American president, by announcing his war strategy for Afghanistan and central Asia, stepped on all those promises given by him to the nation during the election campaign about complete withdrawal of American forces from Afghanistan, thus putting an end to the longest and absolutely futile war of their modern history. 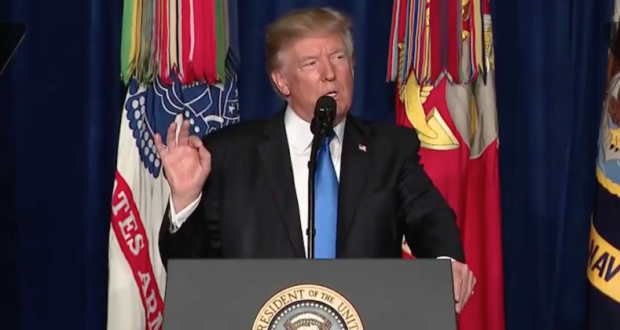 Having been waited for long, eventually on Monday 22nd August, Trump declared his strategy for Afghanistan in which, instead of withdrawing his forces from this war stricken country to fulfill his election campaign pledge, he vowed to send even more troops to Afghanistan to crush his enemies. In his aggressive strategy, he explicitly blamed Pakistan – one of the neighboring countries of Afghanistan – for providing sanctuaries to those fighting against the American interests in Afghanistan, according to his perception. In return, both Pakistan and Iran along other regional and influential powers like China and Russia explicitly disapproved American’s new strategy for Afghanistan and South Asia, labelling it venomous and unreasonable. Russia, China and other regional countries argue that in NATO’s meeting in Lisbon in 2010, it was decided that all foreign forces will gradually be evacuated from Afghanistan by the end of 2014 but this decision was not abide by America who has left her forces inside Afghanistan for an unknown period. Instead of helping the Afghan masses, this strategy is viewed as extremely harmful for peace and stability of the region in broader perspective. On the other hand, this new ambiguous strategy of Trump has been widely and severely criticized inside America itself and it has been declared as absolutely against the benefits and interests of America and its people. In a survey conducted by Fox News, a famous American TV channel, it clearly showed that 62% American people are completely against extending this futile war in Afghanistan by deploying additional American troops. In this survey, only 29% people have approved this strategy while 8% have abstained from participation. Similarly inside Afghanistan, with the exception of a trivial number of those people who are direct beneficiaries of American funds as officials or contractors, the vast majority of the people have explicitly expressed their hatred and resentment against this ridiculous and terrible approach of the new American administration to the Afghan dilemma, considering it a new tug-of-war inside Afghanistan between world and regional powers. According to analysts, the extension of American forces inside Afghanistan and Trump’s insistence on war strategy is a blatant enmity with the interests and will of Afghan people, which is durable peace and stability in their beloved homeland. Over the past 16 years, despite all their brutalities and violence, the American forces failed to subdue their armed opponents and neither could they restore lasting peace and stability in any part of the Afghanistan. How on earth can they achieve this isolated goal with the deployment of such an insignificant number of additional forces? The Afghans were expecting America to have learned from their previous bitter and tough experiences, and their new strategy might be based upon reason by seeking peace and harmony in the region, beneficial for the oppressed people of Afghanistan as well as the war weary people of America. But, it seems that the Afghan issue is only a pretext for the American war mongers who are mainly interested in holding Afghanistan for the deterioration of regional peace and stability for achieving their long and malicious objectives as an integral part of their new power game against some regional and newly emerging world powers. This is why that concerned countries including China and Russia expressed their explicit disapproval of Trump’s newly announced strategy with no delay. It is inevitable that regional and neighboring countries cannot remain indifferent against the devious aspirations and malicious goals of America in the region. Therefore the only rational option left for them is to admit and recognize the legitimate struggle of Afghan freedom and peace loving people by explicitly supporting the righteous cause of the Islamic Emirate of Afghanistan on all regional and international forums!! !